President Trump speaking to Congress, February 28, 2017. 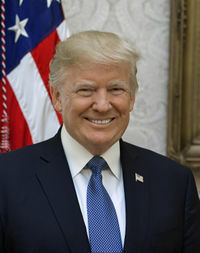 This article is a non-exhaustive list of political achievements of United States President Donald Trump, his administration, and Congress during his administration in passing conservative legislation, advancing conservative ideals, and "Making America Great Again". When adding additional examples, please add at least one reliable source for each example for future reference. Due to the number of achievements, the list of President Trump's achievements have been moved to sub-articles. Please visit the sub-articles to see the Trump Administration's various achievements. In a historic victory, Trump won the 2016 presidential election despite massive opposition from the establishment. He began promoting conservative policies even before his inauguration. Trump was inaugurated on January 20, 2017, giving one of the strongest inauguration addresses in American history. His first bill signed as president was to allow retired general and Defense Secretary nominee James Mattis to be confirmed. Trump had a very busy and productive first week, undoing Obama's legacy and instituting conservative executive orders. He had already made a reasonably large impact by his 50th day in office. President Trump accomplished many of his campaign promises by his 100th day in office, and he had already made significant progress by then, most notably by reducing regulations, enforcing American immigration laws, and appointing and having the Senate confirm his Supreme Court nominee Neil Gorsuch. In his first 100 days as president, Trump signed the most pieces of legislation of any president since Harry Truman and more executive orders than any previous president. By his 100th day, it was clear that Trump had disrupted the liberal political establishment consensus. The Trump Administration was able to achieve numerous accomplishments by its first year in office, and it kept many of its promises. According to Reuters in late September 2017, President Trump had "begun to reshape American life in ways big and small." He undid many of Barack Obama's executive orders and worked to undo his entire political legacy. Not only did President Trump act as a disruptor, but he "set in motion an administration arguably more conservative than Ronald Reagan’s." In 2018, President Trump continued advancing a conservative agenda, this time focusing on the more nationalistic portions of it, and he continued undoing Obama Administration policies. He received some help from Congress to advance his agenda. By the beginning of 2019, President Trump had either kept or made progress on many of his campaign promises, and he continued advancing conservative policies. His policies led to much progress for blacks, homosexuals, and Jews. Please visit the sub-articles below to see President Trump's individual achievements, arranged by topic area. Because of his promotion and support of conservative, America First policies, President Trump faced unprecedented opposition from the Left and the establishment, including from within the government bureaucracy. Even some White House officials worked against the president's agenda. The Trump Administration was the victim of numerous leaks of information, many of which threatened U.S. national security – it was reported in July 2017 that leaks occurred once a day on average, and Trump faced seven times more leaks than Obama or Bush II did. The Russia probe headed by Independent Counsel and former FBI Director Robert Mueller was founded to have hired investigators extremely biased against President Trump, and leftists went out of their way searching for evidence of crimes by President Trump. Left-wing federal courts also blocked many Trump Administration actions, including President Trump's executive orders regarding sanctuary cities and immigration, and Democrat attorneys general were extremely active against the Trump Administration, suing it nearly 50 times in 2017 alone. After his election, left-wingers labeled themselves as the "resistance" against Trump and even changed their political views in reaction to President Trump's. As a testament to the deep opposition and hatred towards him by the left-wing, at least 217 violent protestors were arrested in Washington D.C. on Inauguration Day. Left-wingers committed or advocated for many other acts of violence against President Trump and his supporters. It was reported in early February 2017 that 12,000 tweets already had called for Trump's assassination. The mainstream media helped promote such violence. In addition to domestic opposition, President Trump, and by extension, the United States, was strongly opposed by non-Americans compared to the Obama Administration, despite a majority of non-Americans believing Trump to be a strong leader. The mainstream media took an overwhelmingly negative stance toward President Trump according to multiple studies, frequently attacking him and his supporters, even to the point of promoting violence against them. The media also refused to credit Trump for the economic growth under his presidency, and it even attributed some of his achievements to Obama. In addition to the above, Senate Democrats unduly delayed President Trump's nominees at historic and unprecedented proportions – by February 8, 2017, only George Washington had fewer cabinet nominees confirmed by this length of time into his presidency. Trump's last cabinet secretary was confirmed on April 27, 2017, and his last cabinet-level member assumed office on May 15, 2017. The GOP establishment also blocked President Trump's conservative agenda. President Trump was still able to implement new policies and roll back Obama's policies despite the opposition against him, which served as a distraction from the changes being made. Additionally, numerous polls found that he had higher approval ratings than several globalist world leaders. Boyle, Matthew (January 20, 2017). ‘America First’: President Donald Trump Brings the Rain in Inauguration Address. Breitbart. Retrieved January 20, 2017. Newman, Alex (January 20, 2017). President Trump Cites Bible in Unity Call; Touts “America First”. The New American. Retrieved June 20, 2018. Dinan, Stephen; Howell, Thomas (January 20, 2017). President Trump vows to put 'America first' and promises to 'get the job done'. The Washington Times. Retrieved June 3, 2018. Bender, Michael C. (January 20, 2017). Donald Trump Strikes Nationalistic Tone in Inaugural Speech. The Wall Street Journal. Retrieved June 3, 2018. Holland, Steve; Stephenson, Emily (January 20, 2017). Trump, now president, pledges to put 'America First' in nationalist speech. Reuters. Retrieved June 3, 2018. Scott, Patrick; Midgley, Robert (January 20, 2017). Donald Trump just delivered the most 'American' inauguration speech ever. The Telegraph. Retrieved January 20, 2017. McCaskill, Nolan D. (January 20, 2017). Key moments from Trump's inauguration speech. Politico. Retrieved January 20, 2017. Yeip, Randy (February 20, 2017). On Speaking Terms: How Donald Trump's Inauguration Speech Compares with Other Presidents. The Wall Street Journal. Retrieved June 4, 2018. President Trump puts fight against ‘radical Islamic terrorism’ at heart of inauguration speech. The Times of Israel. January 20, 2017. Retrieved January 20, 2017. Martel, Frances (January 20, 2017). In Inaugural Address, Trump Reaffirms Vow to ‘Eradicate’ Radical Islamic Terrorism. Breitbart News. Retrieved September 24, 2017. Martel, Frances (January 20, 2017). History: Trump Becomes First President to Use Words ‘Islamic,’ ‘Urban’ in Inaugural Address. Breitbart News. Retrieved September 24, 2017. President Trump Delivers Inaugural Address. C-SPAN. January 20, 2017. Retrieved June 3, 2018. Full text of President Donald Trump's inauguration speech. Fox News. January 20, 2017. Retrieved June 3, 2018. Taylor, Guy (January 20, 2017). Trump inaugural speech makes international waves. The Washington Times. Retrieved June 3, 2018. President Trump 2017 Inaugural Ceremony. C-SPAN. January 20, 2017. Retrieved June 3, 2018. Davenport, David (January 27, 2017). How Trump Managed To Undo Obama's Legacy In One Week. Forbes. Retrieved January 27, 2017. Said-Moorhouse, Lauren (January 26, 2017). What's Trump done so far? His productive first week and how it stacks up to previous presidents. CNN. Retrieved January 27, 2017. President Trump's First Week of Action. whitehouse.gov. January 28, 2017. Retrieved January 28, 2017. Newman, Alex (January 20, 2017). President Trump Unveils Plans to Undo Much of Obama's Damage. The New American. Retrieved March 13, 2019. Spiering, Charlie (January 23, 2017). High Energy! President Donald Trump’s Big First Week. Breitbart News. Retrieved June 3, 2018. ↑ Kew, Ben (March 10, 2017). Major Impact: President Donald Trump’s First 50 Days in Office. Breitbart News. Retrieved March 10, 2017. Kew, Ben (April 28, 2017). Making America Great Again: Donald Trump’s 100 Days’ Success. Breitbart News. Retrieved April 29, 2017. Wise, Lindsay (April 27, 2017). Think Trump didn’t achieve much in his first 100 days? Think again. The Sacramento Bee. Retrieved April 29, 2017. Singman, Brooke (April 29, 2017). Trump's first 100 days: Did he keep his promises? Fox News. Retrieved April 29, 2017. Hoft, Jim (April 27, 2017). Complete List of President Trump’s Major Accomplishments in First 100 Days. The Gateway Pundit. Retrieved December 28, 2018. Trump's First 100 Days. The New American. April 29, 2017. Retrieved December 28, 2018. List of Trump's executive orders. Fox News. April 28, 2017. Retrieved December 28, 2018. The First 100 Days of Trump: Breitbart Special Report. Breitbart News. Retrieved December 28, 2018. Breitbart News Releases e-Book: ‘The First 100 Days of Trump’. Breitbart News. May 1, 2017. Retrieved December 28, 2018. ↑ Singman, Brooke (April 29, 2017). Trump's first 100 days – by the numbers. Fox News. Retrieved April 29, 2017. ↑ Derespina, Cody (April 29, 2017). 100 Days of Disruption: How Trump rewrote the presidential script. Fox News. Retrieved April 29, 2017. Malone, Jim (October 19, 2017). Trump Lives Up to Pledge to Be Disrupter, But Country Divided Over Results. Voice of America. Retrieved October 19, 2017. Pappas, Alex (December 27, 2017). Trump ends 2017 with big wins on economy, taxes, ISIS and more. Fox News. Retrieved December 27, 2017. Bedard, Paul (December 21, 2017). Year One List: 81 major Trump achievements, 11 Obama legacy items repealed. Washington Examiner. Retrieved December 21, 2017. Conradis, Brandon (December 25, 2017). Trump’s top 10 accomplishments of 2017. The Hill. Retrieved December 25, 2017. Westwood, Sarah; Morrongiello, Gabby (December 28, 2017). Trump's top 9 accomplishments of 2017. Washington Examiner. Retrieved December 31, 2017. Spiering, Charlie (December 28, 2017). Top 12 MAGA Moments in Donald Trump’s First Year as President. Breitbart News. Retrieved December 28, 2017. Cortes, Steve (December 30, 2017). Trump's 2017 Top 10 Achievements. RealClearPolitics. Retrieved December 28, 2018. Scaliger, Charles (February 9, 2018). Donald Trump: 1st Year. The New American. Retrieved February 11, 2018. Groppe, Maureen (January 19, 2018). First year of Trump-Pence brings bountiful blessings, religious conservatives say. USA Today. Retrieved January 20, 2018. 17 Reasons Why American Christians Celebrated in 2017. CBN News. December 31, 2017. Retrieved March 1, 2018. Hanson, Victor Davis (February 5, 2018). The Many Wars of Donald Trump. National Review. Retrieved December 29, 2018. Woodward, Calvin; Colvin, Jill (January 15, 2018). Trump has kept many promises during his first year in office. Associated Press. Retrieved January 15, 2018. Woodward, Calvin; Colvin, Jill (January 15, 2018). Trump has kept many promises during his first year in office. Fox News (from the Associated Press). Retrieved January 15, 2018. Associated Press Admits: Trump Has Kept Many Promises His First Year in Office. Breitbart News. January 16, 2018. Retrieved January 16, 2018. Basu, Zachary (January 15, 2018). Trump follows through on dozens of campaign promises in first year. Axios. Retrieved January 15, 2018. ↑ Whitesides, John (September 28, 2017). Beyond the daily drama and Twitter battles, Trump begins to alter American life. Reuters. Retrieved October 6, 2017. Beyond the Daily Drama and Twitter Battles, Trump Begins to Alter American Life. The Washington Free Beacon (from Reuters). September 29, 2017. Retrieved October 6, 2017. Pappas, Alex (September 8, 2017). Trump is dismantling Obama’s executive action legacy. Fox News. Retrieved September 9, 2017. Boyer, Dave (October 16, 2017). Trump dismantles Obama’s ‘imperial’ presidency, rescinds dubious orders. The Washington Times. Retrieved October 17, 2017. Stanage, Niall (October 16, 2017). The Memo: Trump tries to turn back clock on Obama era. The Hill. Retrieved October 17, 2017. Cawthorne, Cameron (October 16, 2017). Trump: ‘Not Too Many’ Obama Administration Policies Will Be Kept in Place. The Washington Free Beacon. Retrieved October 17, 2017. Schallhorn, Kaitlyn (December 27, 2017). How Trump is rolling back Obama's legacy. Fox News. Retrieved December 27, 2017. How Trump dismantled Obama's legacy in 1 year. WND. January 18, 2018. Retrieved January 19, 2018. Eilperin, Juliet; Cameron, Darla (March 24, 2017). How Trump is rolling back Obama’s legacy. The Washington Post. Retrieved December 26, 2018. ↑ Hayward, Steven F. (November 5, 2017). Despite the chaos, Trump has managed to push the most conservative agenda in a generation. Los Angeles Times. Retrieved November 28, 2017. Bedard, Paul (November 27, 2018). Trump brags, ‘I blow Ronald Reagan away’. Washington Examiner. Retrieved November 27, 2018. Morris, Kyle (November 27, 2018). Donald Trump Touts Presidential Accomplishments: ‘I Blow Ronald Reagan Away’. Breitbart News. Retrieved November 27, 2018. Burke, Michael (November 27, 2018). Trump: People would say I'm 'far greater than Ronald Reagan' if my name weren't Trump. The Hill. Retrieved November 27, 2018. Mikelionis, Lukas (November 28, 2018). Trump claims accomplishments 'blow Ronald Reagan away,' blasts 'false and corrupt' media: new book. Fox News. Retrieved November 28, 2018. Seib, Gerald F. (April 3, 2018). Trump Plunges Ahead With America-First, Nationalist Approach. The Wall Street Journal. Retrieved April 8, 2018. Miller, S.A. (May 13, 2018). Trump reshaping GOP by breaking away from traditional conservative policies. The Washington Times. Retrieved May 14, 2018. Seib, Gerald F. (June 18, 2018). As Trump Veers From Traditional GOP, He Bends It Toward Him. The Wall Street Journal. Retrieved June 18, 2018. Lewandowski, Corey (August 20, 2018). Booming economy, kept promises, making America great — again. The Hill. Retrieved August 20, 2018. Wolf, Zachary B.; Carman, JoElla (February 1, 2019). Here are all the treaties and agreements Trump has abandoned. CNN. Retrieved February 1, 2019. Bedard, Paul (September 5, 2018). List: White House touts 52 ‘accomplishments' Woodward ignored. Washington Examiner. Retrieved September 5, 2018. Bedard, Paul (October 12, 2018). Trump’s List: 289 accomplishments in just 20 months, ‘relentless’ promise-keeping. Washington Examiner. Retrieved October 12, 2018. Spiering, Charlie (December 28, 2018). The Top 12 MAGA Moments for Donald Trump in 2018. Breitbart News. Retrieved December 28, 2018. Bedard, Paul (December 31, 2018). MAGA list: 205 ‘historic results’ help Trump make case for 2020 reelection. Washington Examiner. Retrieved December 31, 2018. Hanson, Victor Davis (January 3, 2019). Actually, 2018 Was a Pretty Good Year. RealClearPolitics. Retrieved January 3, 2019. Cortes, Steve (December 30, 2018). Trump's Top 10 Achievements of 2018. RealClearPolitics. Retrieved January 21, 2019. Chamberlain, Samuel (May 9, 2018). Pullout from Iran nuclear deal is latest Trump move to dismantle key Obama policies. Fox News. Retrieved May 9, 2018. Harder, Amy; Baker, Sam; Swan, Jonathan (August 2, 2018). Trump's stealth attack on Obama's legacy. Axios. Retrieved August 2, 2018. Pollak, Joel B. (September 17, 2018). Pollak: Celebrating Two Years of Restoration Under President Trump on Constitution Day. Breitbart News. Retrieved September 17, 2018. ↑ Boyer, Dave (May 29, 2018). Trump sees Congress buck tradition of legislative loafing, make significant progress on agenda. The Washington Times. Retrieved May 29, 2018. Bedard, Paul (September 4, 2018). Trump breaks 20-year ‘fouled up’ budget gridlock, scores big wins. Washington Examiner. Retrieved September 4, 2018. Owens, Caitlin (August 15, 2018). Surprise: One area where Congress is functioning. Axios. Retrieved August 20, 2018. Mass, Warren (August 20, 2018). Trump and McConnell Mend Fences to Pursue Common Goals. The New American. Retrieved August 20, 2018. Pergram, Chad (October 13, 2018). Amid Kavanaugh cacophony, Congress forges bipartisan agreements on key issues. Fox News. Retrieved October 13, 2018. Fakkert, Jasper (January 20, 2019). American Revival: 70 Ways President Trump Has Changed the Nation Over the Past Two Years. The Epoch Times. Retrieved January 21, 2019. Schallhorn, Kaitlyn (January 19, 2019). Trump at presidential halfway mark: Where he stands on campaign promises. Fox News. Retrieved January 19, 2019. Horsley, Scott (January 20, 2019). Progress Report: President Trump's Campaign Promises, 2 Years Later. NPR. Retrieved January 21, 2019. Henney, Megan (January 20, 2019). Trump's first two years in office: A look at his biggest achievements and failures. Fox Business. Retrieved January 21, 2019. The Historic Results of President Donald J. Trump’s First Two Years in Office. The White House. January 20, 2019. Retrieved January 22, 2019. Trump presents 'historic results' of two years in office. Arutz Sheva. January 20, 2019. Retrieved January 22, 2019. McDaniel, Ronna (January 20, 2019). RNC Chairwoman Ronna McDaniel: Trump has delivered two historic years of promises made, promises kept. Fox News. Retrieved January 20, 2019. Glassner, Michael (January 20, 2019). Trump has survived a coordinated campaign to defy him – Two years later he's achieved much of his agenda. Fox News. Retrieved January 20, 2019. Herman, Arthur (January 20, 2019). Trump at the halfway mark: How will history judge our unconventional president? Fox News. Retrieved January 20, 2019. Thiessen, Marc (January 2, 2019). Marc Thiessen: Trump's 10 most surprising successes after two years in office. Fox News. Retrieved January 22, 2019. Toma, Danny (February 14, 2019). How to understand 'America First'. Washington Examiner. Retrieved February 14, 2019. Howell, Tom (March 7, 2019). Trump finds governing harder than it looks: 'As a businessman he could negotiate'. The Washington Times. Retrieved March 8, 2019. ↑ Hillyer, Quin (March 27, 2019). Trump’s executive actions advance good government. Washington Examiner. Retrieved March 27, 2019. Pollak, Joel B. (March 24, 2019). Pollak: Democrats Embrace Socialism Because Trump Has Seized the Middle Ground. Breitbart News. Retrieved March 24, 2019. Knowles, Michael (March 10, 2019). Trump is more principled than his critics on left and right. Fox News. Retrieved March 10, 2019. ↑ Pollak, Joel B. (February 22, 2019). Blue State Blues: Trump Is the Most ‘Progressive’ President Ever for Blacks, Gays, Jews. Breitbart News. Retrieved February 22, 2019. ↑ Spiering, Charlie (April 4, 2017). Donald Trump to American Workers: ‘I’m Not, and I Don’t Want to Be, the President of the World’. Breitbart News. Retrieved April 5, 2017. Spiering, Charlie (October 17, 2017). Donald Trump: Foreign Countries Like Greece ‘Nervous’ About ‘America First’ Agenda. Breitbart News. Retrieved October 18, 2017. Klein, Aaron (April 28, 2017). Trump’s First 100 Days: Establishment Goes to War to Halt President’s Agenda. Breitbart News. Retrieved April 28, 2017. Miller, S.A. (June 20, 2017). Isolated from Washington establishment, Trump struggles for presidential victories. The Washington Times. Retrieved June 21, 2017. Scarborough, Rowan (December 9, 2018). 'Presidential harassment': Trump under unprecedented attack on multiple fronts. The Washington Times. Retrieved December 9, 2018. Hilton, Steve (January 21, 2019). Steve Hilton: Trump is daring to clean up the establishment's biggest messes – and they hate him for it. Fox News. Retrieved January 21, 2019. Wolfgang, Ben (January 6, 2019). Trump on unprecedented collision course with retired military commanders: 'It's not normal'. The Washington Times. Retrieved January 7, 2019. Singman, Brooke (January 31, 2017). Trump faces bureaucratic battle in implementing agenda. Fox News. Retrieved February 1, 2017. Kurtz, Howard (February 3, 2017). The empire strikes back: Why Trump's private talks with foreign leaders were leaked. Fox News. Retrieved February 3, 2017. Starr, Penny (December 19, 2017). Federal Bureaucrats Continue to Advance Obama’s Agenda, Including Climate Change Promotion. Breitbart News. Retrieved December 20, 2017. Newman, Alex (January 8, 2018). Deep State Bureaucracy vs. Trump, America, Constitution. The New American. Retrieved January 9, 2018. Rogers, Brian (September 13, 2017). Obama holdovers are slowing Trump's agenda in key agencies. Washington Examiner. Retrieved December 20, 2017. Gallington, Daniel (June 7, 2017). Loyalty matters. The Washington Times. Retrieved December 20, 2017. Pollock, Richard; Barton, Ethan (August 14, 2017). EXCLUSIVE: Obama Holdovers Still In Dozens Of Key National Security Council Jobs. The Daily Caller. Retrieved December 20, 2017. Garcia, Carlos (November 17, 2017). ICE union says Obama holdovers are sabotaging immigration enforcement, here’s how. The Blaze. Retrieved December 20, 2017. Anderson, Troy (February 21, 2019). Trump vs. Deep State. The New American. Retrieved February 21, 2019. Richwine, Jason (February 19, 2019). When Bureaucrats Veto the President. National Review. Retrieved February 21, 2019. Newman, Alex (September 6, 2018). Deep State Mole in White House Boasts of Sabotaging Trump. The New American. Retrieved September 6, 2018. Chamberlain, Samuel (September 5, 2018). WH official pens anonymous NY Times op-ed calling Trump 'anti-democratic,' 'petty and ineffective'. Fox News. Retrieved September 6, 2018. Spiering, Charlie (September 6, 2018). Deep State Official: ‘There Are Dozens and Dozens of Us’. Breitbart News. Retrieved September 6, 2018. Horing, Shoula Romano (September 5, 2017). An Ideological Coup against Trump? LifeSiteNews. Retrieved March 24, 2018. Munro, Neil (February 19, 2019). Seven Ways Marc Short Stalled Donald Trump’s Immigration Reforms. Breitbart News. Retrieved February 22, 2019. Binder, John (March 6, 2018). 6 Times Globalist Gary Cohn Tried to Derail Trump’s ‘America First’ Agenda. Breitbart News. Retrieved February 22, 2019. Wong, Kristina (August 15, 2017). EXCLUSIVE–Inside General McMaster’s Purge: How National Security Adviser Eliminated Trump Loyalists. Breitbart News. Retrieved February 22, 2019. Jasper, William F. (January 2, 2018). The McMaster Cabal: Lead Operatives in the Deep State Coup Effort to Oust Trump. The New American. Retrieved February 22, 2019. Newman, Alex (February 25, 2017). Some of Trump's Picks Have Troubling Links to Globalism, CFR. The New American. Retrieved January 1, 2018. Newman, Alex (June 2, 2017). Top Trump Officials Attend Globalist Bilderberg Summit. Why? The New American. Retrieved December 1, 2017. Jasper, William F. (December 29, 2017). Deep State Boasts: We’re Sabotaging Trump From the Inside. The New American. Retrieved December 29, 2017. Wong, Kristina (September 7, 2018). Deep State Attacks Ahead of Midterms: ‘All Roads Lead to Impeachment’. Breitbart News. Retrieved September 7, 2018. Lieu, Amy (September 6, 2018). Trump digs in after explosive New York Times op-ed, vows to drain swamp. Fox News. Retrieved September 6, 2018. Samuels, Brett (September 6, 2018). Trump hits the 'deep state,' the 'left' and the media in wake of anonymous op-ed. The Hill. Retrieved September 6, 2018. Pollak, Joel B. (September 5, 2018). Pollak: ‘Anonymous’ Op-ed in New York Times Is the Opposite of Patriotism. Breitbart News. Retrieved September 6, 2018. ↑ Boylan, Dan (July 6, 2017). White House leaks that threaten national security stream out at rate of one a day. The Washington Times. Retrieved July 7, 2017. ↑ Wong, Kristina (July 7, 2017). DEEP STATE: Trump Facing Seven Times More National Security Leaks Than Obama or Bush. Breitbart News. Retrieved July 7, 2017. Ex-Mueller aides' texts revealed: Read them here. Fox News. December 13, 2017. Retrieved January 5, 2018. Singman, Brooke (December 7, 2017). Top Mueller investigator's Democratic ties raise new bias questions. Fox News. Retrieved January 5, 2018. Anti-Trump bias exposed in Mueller probe. Fox News. December 5, 2017. Retrieved January 5, 2018. Chamberlain, Samuel (December 12, 2018). 'F TRUMP': Texts between ex-Mueller team members emerge, calling Trump 'loathsome human,' 'an idiot'. Fox News. Retrieved January 5, 2018. Wong, Kristina (December 13, 2017). Deepstate: FBI Agents Texted About Protecting Country Against Trump. Breitbart News. Retrieved January 5, 2018. Wong, Kristina (April 18, 2019). Attorney General William Barr Releases Mueller Report. Breitbart News. Retrieved April 18, 2019. Read the Robert Mueller report. Fox News. April 18, 2019. Retrieved April 18, 2019. Shaw, Adam (April 18, 2019). Trump declares victory as Mueller report drops: 'No collusion, no obstruction'. Fox News. Retrieved April 18, 2019. Gurman, Sadie; Viswanatha, Aruna (April 18, 2019). Mueller Report Says ‘Fairness Concerns’ Prevented Obstruction Judgment on Trump. The Wall Street Journal. Retrieved April 18, 2019. Shaw, C. Mitchell (April 18, 2019). Mueller Report Released: It's Official — No Collusion, No Proof of Obstruction. The New American. Retrieved April 18, 2019. Mordock, Jeff; Dinan, Stephen (April 18, 2019). Mueller report produces damning exoneration of Trump. The Washington Times. Retrieved April 19, 2019. Stanage, Niall (April 18, 2019). Mueller report: The winners and losers. The Hill. Retrieved April 19, 2019. Re, Gregg (March 24, 2019). Mueller report summary released, showing no proof Trump team conspired with Russia. Fox News. Retrieved March 24, 2019. Pollak, Joel B. (March 24, 2019). Special Counsel: No Russia Collusion ‘Despite Multiple Offers’. Breitbart News. Retrieved March 24, 2019. Wong, Kristina (March 24, 2019). Special Counsel Investigation Finds No Trump Campaign Collusion with Russia. Breitbart News. Retrieved March 25, 2019. Kirkwood, R. Cort (March 24, 2019). Mueller Report Found No Collusion, Obstruction; Angry Democrats Vow Continued Coup Attempts. The New American. Retrieved March 25, 2019. Chalfant, Morgan; Thomsen, Jacqueline; Beavers, Olivia (March 24, 2019). Mueller finds no Trump-Russia conspiracy in 2016 election. The Hill. Retrieved March 24, 2019. Phillips, Jack (March 24, 2019). Mueller Report Summary Published: No Evidence Trump Campaign Conspired With Russia. The Epoch Times. Retrieved March 24, 2019. Gurman, Sadie; Viswanatha, Aruna; Tau, Byron (March 24, 2019). Mueller Doesn’t Find Trump Campaign Conspired With Russia. The Wall Street Journal. Retrieved March 24, 2019. Mordock, Jeff; Dinan, Stephen (March 24, 2019). William Barr: Mueller clears Trump in Russia probe. The Washington Times. Retrieved March 24, 2019. Yilek, Caitlin (March 24, 2019). Mueller clears Trump: No Russia collusion, no obstruction of justice. Washington Examiner. Retrieved March 24, 2019. Johnson, Kevin; Jansen, Bart; Phillips, Kristine (March 24, 2019). Mueller report: Investigation found no evidence Trump conspired with Russia, leaves obstruction question open. USA Today. Retrieved March 24, 2019. Lynch, Sarah N. (March 23, 2019). Mueller report finds no evidence that Trump campaign colluded with Russia: Justice Department. Reuters. Retrieved March 24, 2019. Kirkwood, R. Cort (March 23, 2019). Deep State’s Attempted Coup Via Mueller Fails, but Anti-Trump Plotters Aren’t Finished. The New American. Retrieved March 25, 2019. Starr, Penny (March 25, 2019). The Left Post Mueller Report: Nine Trump-Related Investigations Will Continue Unabated. Breitbart News. Retrieved March 25, 2019. Kirkwood, R. Cort (March 25, 2019). Trump Derangement Worsens, Despite Mueller Report, Dems Still Think He Committed a Crime. The New American. Retrieved March 25, 2019. Betz, Bradford (March 12, 2019). New York Attorney General opens civil investigation into Trump projects: report. Fox News. Retrieved March 25, 2019. Fakkert, Jasper (April 10, 2019). The Attempted Coup Against Trump. The Epoch Times. Retrieved April 11, 2019. Swoyer, Alex (February 27, 2018). Judges unleash ‘political weapon’ against Trump. The Washington Times. Retrieved February 28, 2018. Ingraham: Runaway judges vs. the Trump agenda. Fox News (via YouTube). February 23, 2018. Retrieved March 1, 2018. McCarthy, Andrew C. (November 10, 2018). Obama’s Judges Continue Thwarting Trump. National Review. Retrieved November 10, 2018. Dinan, Stephen (November 20, 2018). Obama-appointed judges undercut Trump on immigration. The Washington Times. Retrieved November 21, 2018. Miller, S.A.; Dinan, Stephen (November 25, 2018). Trump more right than Roberts on 'Obama judges': Washington Times analysis. The Washington Times. Retrieved November 26, 2018. Dinan, Stephen (January 1, 2019). Obama judges order Justice Department lawyers to stay on immigration cases without pay. The Washington Times. Retrieved January 2, 2019. French, David (January 14, 2019). Lawless Federal Judges Are Winning Their War against the Trump Administration. National Review. Retrieved January 15, 2019. Nakamura, David (January 15, 2019). Courts thwart Trump’s bid to enact hard-line immigration agenda as Congress dithers. The Washington Post. Retrieved January 16, 2019. Hammer, Josh (January 17, 2019). HAMMER: It Is Past Time For Trump To Openly Defy A Federal Court. The Daily Wire. Retrieved January 18, 2019. Blackman, Josh (February 12, 2018). On the Judicial Resistance. Lawfare. Retrieved January 18, 2019. Lucas, Fred (February 4, 2019). Federal District Judges Have Blocked Trump Actions 30 Times, a Record Rate. The Daily Signal. Retrieved February 7, 2019. Barbash, Fred; Paul, Deanna (March 19, 2019). The real reason the Trump administration is constantly losing in court. The Washington Post. Retrieved April 3, 2019. Weixel, Nathaniel (March 30, 2019). Trump's health overhaul efforts hit legal roadblocks. The Hill. Retrieved March 30, 2019. Roundup: Trump-Era Deregulation in the Courts. Institute for Policy Integrity. Retrieved April 5, 2019. Higgins, Tucker (January 24, 2019). The Trump administration has lost more than 90 percent of its court battles over deregulation. CNBC. Retrieved April 19, 2019. Mordock, Jeff (March 10, 2018). Sessions blasts federal judges for injunctions against Trump administration policies. The Washington Times. Retrieved March 10, 2018. Shaw, Adam (March 10, 2018). Sessions slams 'activist judges' for nationwide injunctions on sanctuary cities, DACA. Fox News. Retrieved March 10, 2018. Munro, Neil (November 20, 2018). DHS, DoJ Slam Judge’s Order to Let Illegal Migrants Apply for Asylum. Breitbart News. Retrieved November 21, 2018. Horowitz, Daniel (March 14, 2019). Where’s the congressional outrage over judicial power grabs? Conservative Review. Retrieved March 16, 2019. Spiering, Charlie (April 27, 2017). Donald Trump Blasts Ninth Circuit for Blocking Sanctuary Cities Order: ‘See You in the Supreme Court!’ Breitbart News. Retrieved May 4, 2017. Klukowski, Ken (March 12, 2017). Federal Court Blocks Trump Admin’s Immigration Executive Order. Breitbart News. Retrieved May 4, 2017. Kirkwood, R. Cort (November 21, 2018). Judge: Open the Borders; Trump Can’t Block Asylum Claims. The New American. Retrieved November 21, 2018. Dinan, Stephen (November 20, 2018). Judge blocks Trump asylum changes: Caravan can demand protections even after illegal entry. The Washington Times. Retrieved November 21, 2018. Caldwell, Alicia A.; Pérez, Santiago; Kendall, Brent (November 20, 2018). Federal Court Bars U.S. From Enforcing Trump’s Asylum Ban. The Wall Street Journal. Retrieved November 21, 2018. DeMarche, Edmund; Brown, Benjamin (November 20, 2018). Judge bars US from enforcing Trump administration’s asylum ban. Fox News. Retrieved November 21, 2018. Horowitz, Daniel (December 6, 2018). Judges are now openly treating illegal immigration as the new civil rights movement. Conservative Review. Retrieved March 21, 2019. Horowitz, Daniel (March 20, 2019). At SCOTUS this week: Conservatives won an immigration battle but continue to lose the war. Conservative Review. Retrieved March 21, 2019. Spiering, Charlie (April 9, 2019). Donald Trump Slams Ninth Circuit Judge for Blocking Border Enforcement. Breitbart News. Retrieved April 9, 2019. Horowitz, Daniel (April 9, 2019). Where does the Constitution say that California judges control our border policy? Conservative Review. Retrieved April 9, 2019. Hurley, Lawrence; Chung, Andrew (November 2, 2017). Trump's opponents race to the courthouse to thwart him. Reuters. Retrieved February 27, 2018. Lucas, Fred (February 6, 2018). Democratic AGs swarm Trump administration with lawsuits. Fox News. Retrieved February 6, 2018. ↑ Wilson, Reid (January 2, 2018). Democratic AGs sue Trump at record pace. The Hill. Retrieved January 3, 2018. ↑ Pollak, Joel B. (December 24, 2017). 2017: The Year in ‘Resistance’. Breitbart News. Retrieved December 24, 2017. ↑ Boyer, Dave; Howell, Tom (February 4, 2019). Trump's backing fuels 'resistance' on issues Democrats traditionally support. The Washington Times. Retrieved February 4, 2019. Weber, Joseph (January 20, 2017). Hundreds of protesters arrested in Inauguration Day clashes. Fox News. Retrieved March 31, 2017. Noble, Andrea; McDermott, Ryan M. (January 20, 2017). D.C. police report 217 arrested during Inauguration Day riots. The Washington Times. Retrieved March 31, 2017. Clark, Alex (June 18, 2017). A Year of Hate: 9 Times the Radicalized Left Engaged in Violence in the Trump Era. Breitbart News. Retrieved June 18, 2017. Nolte, John (July 5, 2018). Rap Sheet: ***639*** Acts of Media-Approved Violence and Harassment Against Trump Supporters. Breitbart News. Retrieved February 18, 2019. Brooks, Dave (June 16, 2017). This List of Attacks Against Conservatives is Mind Blowing. The Daily Caller. Retrieved August 5, 2018. Facebook Live attack the latest in string of anti-Trump assaults. Fox News. January 5, 2017. Retrieved February 28, 2019. Kirkwood, R. Cort (September 14, 2018). Anti-Trump Violence Ramps Up With Attempted Stabbing. The New American. Retrieved September 14, 2018. Nolte, John (March 13, 2019). There Have Been 334 Reported Hate Crimes Against Trump Supporters. Breitbart News. Retrieved March 13, 2019. Hasson, Peter (February 18, 2019). Here's a List of Hoax 'Hate Crimes' in the Trump Era. The Daily Caller. Retrieved February 20, 2019. Lapin, Tamar (February 21, 2019). The list of bogus ‘hate crimes’ in Trump era is long. New York Post. Retrieved February 23, 2019. Giaritelli, Anna (February 18, 2019). Jussie Smollett case the latest in long line of hoax racist attacks. Washington Examiner. Retrieved February 18, 2019. Andy Ngo. Twitter. February 16, 2019. Retrieved February 18, 2019. Parke, Caleb (December 27, 2017). Hate crimes and hoaxes: 10 campus stories debunked in 2017. Fox News. Retrieved February 28, 2019. Nolte, John (February 19, 2019). Nolte: Jussie Smollett Media Hoax Is a Hate Crime Against Trump Supporters. Breitbart News. Retrieved February 20, 2019. Gomez, Christian (April 3, 2019). Hate Hoaxes: Rise of Fake “Hate Crimes”. The New American. Retrieved April 3, 2019. Kew, Ben (July 21, 2017). Study: Nearly Half of Liberals Feel Disdain for Trump Supporters, Conservatives Far More Tolerant. Breitbart News. Retrieved July 21, 2017. Munro, Neil (February 19, 2019). Study Debunks Claim That Trump Voters More Supportive of Violence than Democrats. Breitbart News. Retrieved February 19, 2019. Adelmann, Bob (August 5, 2018). The War On Trump: From Confrontation to Harassment to … Violence?. The New American. Retrieved August 5, 2018. ↑ More than 12,000 tweets have called for Trump's assassination since the inauguration. Daily Mail. Retrieved June 18, 2017. ↑ Harper, Jennifer (June 15, 2017). Expert identifies top media lies ‘that radicalized the violent left’. The Washington Times. Retrieved June 17, 2017. Nolte, John (September 12, 2018). Violence Against Right Escalates as Media Amp up Hate-Rhetoric Against Trump. Breitbart News. Retrieved September 12, 2018. Ault, Nicole (June 27, 2017). Trump’s low global ratings call for caution, not despair. The Washington Times. Retrieved June 28, 2017. Wike, Richard; Stokes, Bruce; Poushter, Jacob; Fetterolf (June 26, 2017). U.S. Image Suffers as Publics Around World Question Trump’s Leadership. Pew Research Center. Retrieved July 21, 2017. Zanona, Melanie (July 5, 2017). International travel to US on the rise. The Hill. Retrieved July 6, 2017. Lane, Oliver JJ (January 3, 2019). Trump: ‘If I Were Popular in Europe, I Wouldn’t Be Doing My Job’. Breitbart News. Retrieved January 3, 2019. Huston, Warner Todd (March 2, 2017). Study Finds 88 Percent of Media Coverage is Anti-Trump. Breitbart News. Retrieved December 1, 2018. Richardson, Valerie (May 19, 2017). Harvard agrees: Trump press coverage sets ‘new standard for negativity’. The Washington Times. Retrieved May 19, 2017. York, Byron (May 19, 2017). Byron York: Harvard study: CNN, NBC Trump coverage 93 percent negative. Washington Examiner. Retrieved March 26, 2019. Shaw, Adam (May 19, 2017). Study: Media Coverage of Trump’s First 100 Days Set ‘New Standard For Negativity’. Breitbart News. Retrieved May 19, 2017. Noyes, Rich; Ciandella, Mike (September 12, 2017). Study: The Liberal Media’s Summer of Pummeling Trump. NewsBusters. Retrieved January 15, 2019. Mitchell, Amy; Gottfried, Jeffrey; Stocking, Galen; Matsa, Katerina Eva; Grieco, Elizabeth (October 2, 2017). Covering President Trump in a Polarized Media Environment. Pew Research Center. Retrieved December 1, 2018. Bedard, Paul (December 27, 2017). Pew: Trump media three times more negative than for Obama, just 5 percent positive. Washington Examiner. Retrieved December 27, 2017. Moran, Sean (December 28, 2017). 2017 Data: Media over Three Times More Negative Towards Trump Than Obama. Breitbart News. Retrieved December 28, 2017. Bannister, Craig (January 16, 2018). Study: 90% of Network Coverage of President Trump Negative in 2017. CNS News. Retrieved January 16, 2018. Blackhurst, Kathryn (January 16, 2018). TV News Spent 2017 Aiming ‘Incessantly Hostile’ Coverage at Trump, Study Shows. LifeZette. Retrieved January 16, 2018. Harper, Jennifer (January 16, 2018). Hostile media: A year of attacking Trump, coverage still 90% negative. The Washington Times. Retrieved January 16, 2018. Noyes, Rich; Ciandella, Mike (January 16, 2018). 2017: The Year the News Media Went to War Against a President. NewsBusters. Retrieved January 15, 2019. Bozell, L. Brent; Graham, Tim (January 17, 2018). 2017: The Year The Media Went To War Against A President. Investor's Business Daily. Retrieved January 15, 2019. Harper, Jennifer (March 6, 2018). Unprecedented hostility: Broadcast coverage of President Trump still 90% negative, says study. The Washington Times. Retrieved March 26, 2019. Caralle, Katelyn (July 25, 2018). 92 percent of TV coverage on Trump's immigration policy is negative: Report. Washington Examiner. Retrieved March 26, 2019. Harper, Jennifer (October 10, 2018). Still hostile: News coverage of President Trump is 92 percent negative, study finds. The Washington Times. Retrieved October 10, 2018. Media Trump Hatred Shows In 92% Negative Coverage Of His Presidency: Study. Investor's Business Daily. October 10, 2018. Retrieved March 26, 2019. Harper, Jennifer (October 31, 2018). Strategically hostile: Broadcast news coverage of Republican Party now 88% negative. The Washington Times. Retrieved December 1, 2018. Flood, Brian (January 15, 2019). Networks' nightly newscasts have ‘incessantly hostile’ tone toward Trump, study indicates. Fox News. Retrieved January 15, 2019. Harper, Jennifer (January 15, 2019). A broadcast tradition: 90% of Trump coverage remains negative, study finds. The Washington Times. Retrieved January 15, 2019. Xiao, Bowen (January 15, 2019). TV Networks’ Coverage of Trump Was 90% Negative in 2018, Study Shows. The Epoch Times. Retrieved January 15, 2019. Barrett, James (January 15, 2019). Study: Here's Just How Insanely Biased News Reporting On Trump Was In 2018. The Daily Wire. Retrieved January 15, 2019. So How Fake Is Fake News? Media Published 500,000-Plus Stories About Russia Collusion. LifeZette. March 25, 2019. Retrieved March 26, 2019. Harper, Jennifer (March 25, 2019). Broadcasters produce 38 hours of 'collusion' coverage, 92% of it was against Trump: Study. The Washington Times. Retrieved March 26, 2019. Dibble, Madison (March 25, 2019). Nearly One in Five Network Evening News Stories About Trump Were ‘Collusion’ Reports, According to Study. Independent Journal Review. Retrieved March 26, 2019. Study: Trump On Track to Be Most Mocked President on Late-Night TV in 25 Years. Breitbart News. May 4, 2017. Retrieved May 4, 2017. Fernandez, Marisa (November 9, 2018). Trump was joked about in late-night TV more than any public figure ever. Axios. Retrieved November 9, 2018. Flood, Brian (December 17, 2018). ‘SNL' is tougher on Trump than past presidents, but NBC won’t let up anytime soon, experts say. Fox News. Retrieved December 17, 2018. Bedard, Paul (January 11, 2018). Pew: US media bias ranks worst in the world. Washington Examiner. Retrieved January 11, 2018. Hart, Kim (May 8, 2018). Nearly half of Americans say Trump media coverage is too tough. Axios. Retrieved May 8, 2018. Gainor, Dan (August 5, 2018). Dan Gainor: The insults, they never stop! Anti-Trump media just can’t help themselves. Fox News. Retrieved August 5, 2018. Kirkwood, R. Cort (August 5, 2018). Acosta, Media Push Trump Derangement Syndrome. The New American. Retrieved August 5, 2018. Kirkwood, R. Cort (August 5, 2018). Trump Derangement Syndrome Intensifies Among Anti-Trump Left. The New American. Retrieved August 5, 2018. Gainor, Dan (January 20, 2019). Trump's been in office two years -- These are the seven top media attacks since his presidency began. Fox News. Retrieved January 20, 2019. McCall, Jeffrey M. (March 26, 2019). Media have account to settle with American people over Mueller investigation coverage. The Hill. Retrieved March 26, 2019. Warren, Steve (March 26, 2019). How the Media 'Tortured' Trump for 2 Years, Crushed Their Own Credibility, and Still Refuse to Back Down. CBN News. Retrieved March 26, 2019. Harper, Jennifer (March 5, 2019). What new jobs? Broadcast news ignores Trump triumphs in the economy, study says. The Washington Times. Retrieved March 5, 2019. Seymour, Julia A. (March 5, 2019). Evening Shows Refuse to Credit Trump for Jobs Boom 98 Percent of the Time. NewsBusters. Retrieved March 5, 2019. Seymour, Julia A. (March 5, 2019). Minority Report: Nets Hide Record Low Unemployment for Blacks, Hispanics. NewsBusters. Retrieved March 5, 2019. Economic Boom: Media Rewrite History To Credit Obama Instead Of Trump. Investor's Business Daily. August 10, 2018. Retrieved August 27, 2018. Harper, Jennifer (August 14, 2018). Mainstream media tries to 'rewrite history' to credit Obama for Trump accomplishments. The Washington Times. Retrieved August 27, 2018. Crowe, Jack (June 13, 2017). WaPo Fact Checkers Surprised To Find Trump Claim ‘Correct’. The Daily Caller. Retrieved June 13, 2017. Singman, Brooke (April 28, 2017). Trump has his Cabinet, but lagging behind on other appointments. Fox News. Retrieved June 5, 2018. Von Spakovsky, Hans A.; Jipping, Thomas (July 30, 2018). The left's obstruction of qualified Trump nominees is yet another front in the war against the president. Fox News. Retrieved November 15, 2018. Rivkin Jr., David B.; Shu, John (August 2, 2018). The Senate’s Unprecedented Obstruction. The Wall Street Journal. Retrieved August 3, 2018. Mordock, Jeff (September 16, 2018). Trump's dilemma: Leave Justice Department control to Sessions and Rosenstein -- or 'deep state'. The Washington Times. Retrieved September 17, 2018. Singman, Brooke (February 8, 2017). Trump facing historic delays in confirmation push. Fox News. Retrieved February 8, 2017. Bluey, Rob (February 13, 2017). Trump Has Fewest Cabinet Secretaries Confirmed Since George Washington. The Daily Signal. Retrieved May 3, 2018. ↑ Kellman, Laurie (April 27, 2017). Senate confirms last member of Trump cabinet at 100th day in office nears. The Washington Times. Retrieved April 27, 2017. ↑ Moons, Michelle (May 15, 2017). President Donald Trump’s Cabinet Complete with Swearing-In of U.S. Trade Representative Robert Lighthizer. Breitbart News. Retrieved May 16, 2017. Starr, Penny (November 9, 2017). GOP Continues to Block President Trump’s Agenda One Year After Election. Breitbart News. Retrieved November 9, 2017. Williams, Joe (December 19, 2017). Republican Senate Starting to Block Trump Nominees. Roll Call. Retrieved January 4, 2018. Adragna, Anthony (February 8, 2018). GOP friendly fire imperils Trump nominees. Politico. Retrieved February 8, 2018. Wallner, James (March 26, 2018). Republicans are making it harder to confirm Trump's nominees. Washington Examiner. Retrieved March 26, 2018. Hillyer, Quin (November 30, 2018). Four Republicans aim at Trump, hit their country instead. Washington Examiner. Retrieved November 30, 2018. Dinan, Stephen (March 14, 2019). GOP senators abandon Trump in border wall fight. The Washington Times. Retrieved March 14, 2019. Bolton, Alexander (March 14, 2019). 12 Republican senators defy Trump on emergency declaration . The Hill. Retrieved March 14, 2019. Moran, Sean (March 14, 2019). Twelve Senate Republicans Voted for Ending Trump’s National Emergency. Breitbart News. Retrieved March 14, 2019. Kirk, Charlie (March 16, 2019). Charlie Kirk: Why Is Trump Having to Fight Alone? Breitbart News. March 17, 2019. Joondeph, Brian C. (March 13, 2019). Donald Trump is a strong commander, but where is his army? LifeSiteNews. Retrieved March 13, 2019. Williams, Thomas D. (December 12, 2017). HuffPo Laments That One Year in, ‘Trump Is Winning’. Breitbart News. Retrieved December 13, 2017. Higgins, Heather R. (December 25, 2017). Against the odds, Trump's agenda owned 2017. The Hill. Retrieved December 28, 2017. Graham, David A. (August 2, 2017). Trump Has Quietly Accomplished More Than It Appears. The Atlantic. Retrieved August 2, 2017. Huffington Post: Trump ‘Has Fundamentally Changed The Country’ While Left Chases Russia Conspiracies. Breitbart News. June 5, 2017. Retrieved June 10, 2017. Vinik, Danny (December 29, 2017). 138 things Trump did this year while you weren't looking. Politico. Retrieved December 29, 2017. Williams, Thomas D. (January 19, 2018). USA Today: Media Pay More Attention to Trump Tweets than Policy. Breitbart News. Retrieved January 19, 2018. Lott, Maxim (December 15, 2018). Despite heat at home, Trump approval ratings tower above embattled European leaders’. Fox News. Retrieved December 5, 2018. Hale, Virginia (November 20, 2018). Trump More Popular Than ‘Establishment’ Euro Leaders Merkel and Macron. Breitbart News. Retrieved December 5, 2018. Bedard, Paul (November 19, 2018). Europe's Merkel, Macron, May less popular than Trump. Washington Examiner. Retrieved December 5, 2018. Donald Trump is reportedly more popular than some of Europe's biggest leaders. AOL. November 21, 2018. Retrieved December 5, 2018. Hale, Virginia (September 6, 2018). MSM Struggles to Come to Terms with Populist Trump Beating Globalist Macron in Poll Ratings. Breitbart News. Retrieved December 5, 2018. Moody, John (August 9, 2017). Suddenly less popular than Trump, France's Macron gets schooled. Fox News. Retrieved December 5, 2018. Adams, Becket (September 5, 2017). Emmanuel Macron more unpopular in France than Trump in US. Washington Examiner. Retrieved December 5, 2018. Tomlinson, Chris (March 20, 2018). Justin Trudeau Approval Rating Now Below President Trump as Right Wing Parties Surge In Canada. Breitbart News. Retrieved December 5, 2018. Nolte, John (February 8, 2018). Media Fail: Trump More Popular than Obama at This Point in Presidency. Breitbart News. Retrieved December 5, 2018. Black, Conrad (2018). Donald J. Trump: A President Like No Other. Washington, D.C.: Regnery Publishing. ISBN 9781621577874. Garrett, Major (2018). Mr. Trump's Wild Ride: The Thrills, Chills, Screams, and Occasional Blackouts of an Extraordinary Presidency. New York: St. Martin's Press. ISBN 9781250185914. Hanson, Victor Davis (2019). The Case for Trump. New York: Basic Books. ISBN 9781541673540. Most comprehensive compilation of Trump's 1st-year achievements, WND, March 10, 2018. Complete List of President Trump’s Accomplishments in the Two Years Since His Historic 2016 Election Win, The Gateway Pundit, November 3, 2018. This page was last modified on 19 April 2019, at 17:55. This page has been accessed 635,704 times.